You know how you’ll run into an Italian restaurant in the US, and it has some kind of Italian name that may not necessarily make sense to Italians but it sounds so, well, Italian. Okay so this is a stretch as a food theme. Work with me here (poor rulingwoman.com is saying hey! You used to write this stuff on me!). Anyhoo. In the neighborhood where I’m staying there is a shop that sells Nikes and other sneakers. Tiny little place I walk by every day on the way to the main stretch of Via Nazionale. They call the store Beaverton. How funny is that. 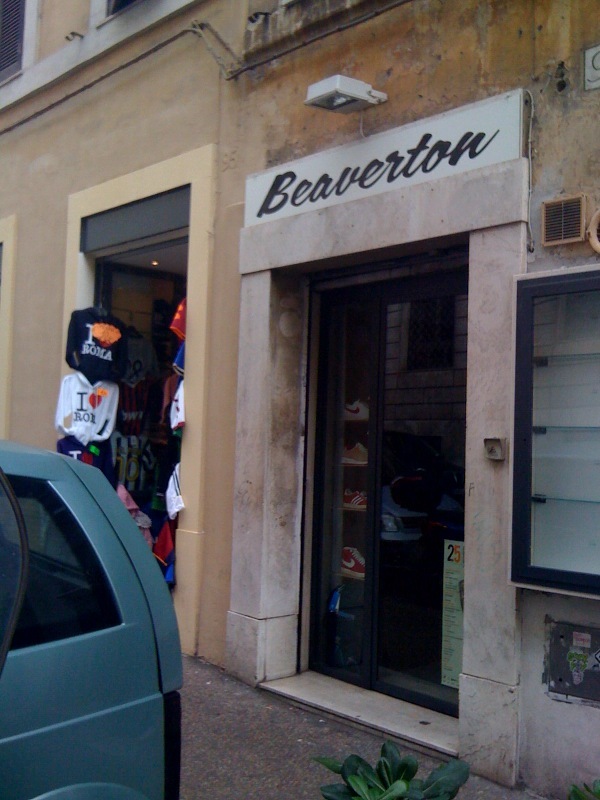 Here we are: girl from Marion Street in Albany, Oregon in Rome happens upon an Italian store — selling sneakers invented in Oregon — and named after a Portland suburb. Well, in fairness, there is a Nike connection but the Italians don’t know that. They probably just find the name clever! Or, should I say ingegnoso.